It isn’t often that I am instantaneously transferred to a place of utter joy and wonder upon the rise of a curtain. It’s a magic moment when the first note of a song, the first utterance of dialogue and the first sight of characters transform the theatre into a happy and magical world. But such was the case with Desert Theatreworks new production of “Into the Woods.” I smiled from the opening of the first act until the closing of Act two. This show is pure enjoyment. 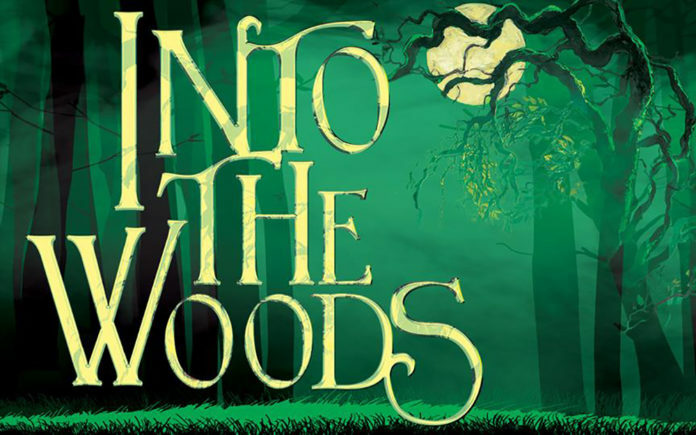 Into The Woods, with music and lyrics by Stephen Sondheim and book by James Lapine, is based on Bruno Bettelheim’s book, “The Uses of Enchantment: the meaning and importance of fairytales.” It weaves together the plots of several tales from the Brothers Grimm and Charles Perrault. Into the Woods, first debuted at the Old Globe Theatre in San Diego in 1986 and had its Broadway opening in 1987. There’s no question as to why this multi-Tony winning show was a hit. It’s a world of fairytales that targets all ages. It explores the stories of Cinderella, Jack and the beanstalk, Little Red Riding Hood, Rapunzel, a baker, a witch and even a cow. It examines their journeys and desires, their wishes and their choices, but it’s so much more than a fairytale. The music will lift you up and the characters will have your eyes glued to their every move. My only critique of the script would be to note that the second act felt much more like a sequel rather than the second part of the same story. But in truth, I’m hard pressed to point out anything that felt off. It’s near impossible to talk about this cast as individuals. They moved and sang and danced, as the well-oiled fantastical storytellers they are. 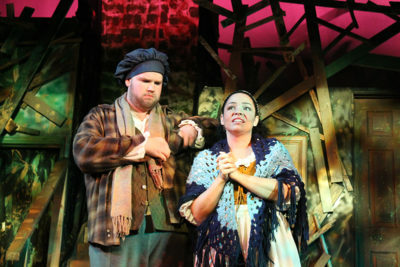 Alisha Bates, as the Baker’s Wife, is always a standout in any performance. She has the skill and the voice to transform any character she takes on. 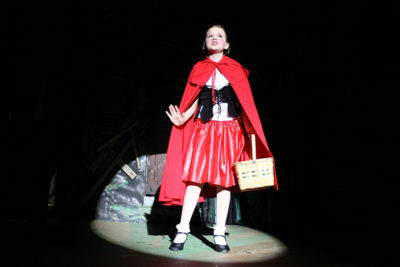 Rebecca Havely, portrayed the Witch, a central and leading character whose engaging evilness was captivating and fun. Stan Jenson is a favorite. In his role as the Narrator and the Mysterious Man, he was a scene stealer. And I have to admit, that I have never been so drawn to a non-speaking farm animal before, but Arik Alvidrez as Milky White the cow, was absolutely wonderful. His ability to be so casual and nonchalant, portraying his character so well without a word of dialogue proved what an exceptional talent he is. There is not the space to sing the praises of every individual member of this cast, each and everyone of them, from the youth ensemble to the leading characters, were just incredible. Bravo to director Lance Phillips-Martinez! His staging of this show can be listed as a crowning achievement for him personally and in desert theatre as a whole. With a cast of 22 he coordinated the movement and the telling of this story with absolute perfection. Heidi Hapner’s choreography was enthralling. The inter-weaving of these characters dance movements was like watching a mountain stream flow seamlessly over and around and through the woods. Jennifer Stowe’s musical direction, Phil Murphy’s lighting design and Phillips-Martinez’s creative set design were all different flavors of icing on this delicious cake. If you are looking for a captivating, feel good, exciting night of theatre, go see Into The Woods! Whether you go with friends, family, a neighbor or just on your own, this isn’t a show you want to miss. Into the Woods, is recommended for family members of all ages and can be seen through October 21st, at The Indio Performing Arts Center, located at 45175 Fargo Street, Indio, CA.